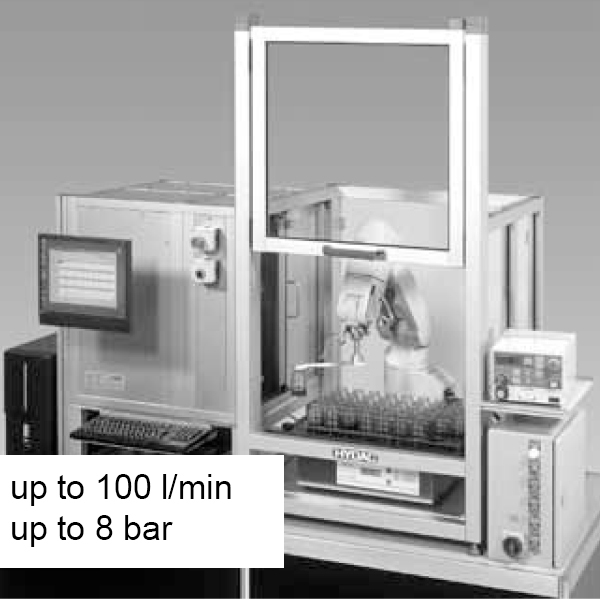 The Automated Laboratory Particle Counter ALPC 9000 is a fully automatic laboratory particle measurement system for hydraulic and lubrication oils. It has a very short measuring times permit analysis of up to 500 samples per day. Moreover, different versions of the ALPC offer either automatic sample feed by means of 5-axis robotic arm (batch processing) or manual sample feed of individual sample bottles. What’s more, its applications are for the laboratories. An automatic and monitored processing of measurement and rinsing cycles. A rapid sample analysis due to very short cycle times for measurement and rinsing. An excellent repeatability of the measurement results by means of replicated testing. It requires only small sample quantities (≈ 50 ml). It has a user-friendly operation and graphical evaluation of the results through the use of ALPC Desk software. Calibrated to ISO11171 and ISO4402: consequently, analysis according to NAS 1638 is also possible.